I'd say you got a nice deal on that cab, @Smithy, especially in a little out of the way shop! It's $7.97 in my local Total Wine, where the Barefoot Merlot sells for $4.97. It can be a good way to save money, but it's also a good test of how much togetherness you can stand. I'll be glad to discuss this more offline, if you wish: the ins and outs of RV life, as well as things to consider for the unit itself. I work from home and she's been upgrading her schooling from home, so we already spend the vast majority of our time together. Admittedly, it's easier to carve out a quiet corner in a big ramshackle house than a (relatively) small RV. I say relatively, because as I told my mom "some of those places were basically your apartment on wheels, except with a fireplace and better appliances." If it starts to look like a serious option, I'll definitely seize on the opportunity to benefit from your experience. 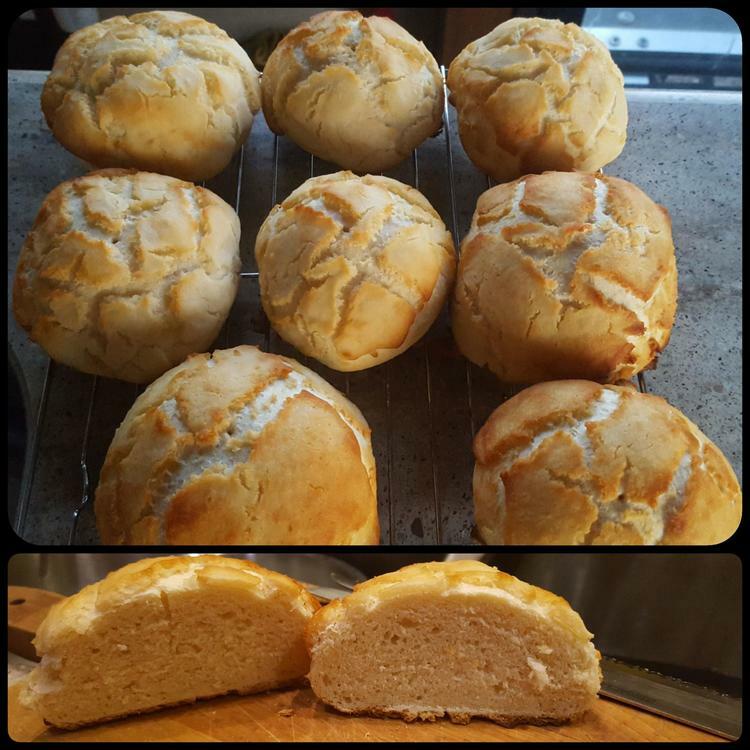 I made Dutch Crunch rolls today, using this recipe. They have a nice crunch, and they look pretty. I'll be interested to see whether they hold up over the next few days for sandwiches, since we didn't have any way to make burgers (my original plan) or ham sandwiches (his dream, when he saw the finished result) today. We thought they were pretty good with dinner tonight, even though it was simply as rolls with the short ribs that I forgot to photograph after they were cooked. They were good, but we were too hungry by then to remember pictures. @Dave the Cook, the grocery store space devoted to gluten-free flour did the trick for me; Bob's Red Mill offers rice flour. Thanks for the tip! @Shelby, come on in! The water's fine! As @ElsieD proposed, this discussion should continue in the bread topic. I count 8 rolls. Having read that this recipe makes 6 large ones, I too wondered about making a few more than that. Are yours the right size for burgs? I plan on trying my hand at them today, and will post about it on the bread topic. You did good!!!! I may have to get brave and try again. Yes, I wanted them to be around 4 oz each, for burger size. As you see I wasn't very careful to get the sizes exactly the same, but they're good enough for our purposes. I'll bet that with your current knowledge of baking you'd find this to be easy. @ElsieD, I have an update in the "YMMV" department. My darling is quite sure these buns won't be big enough for burgers, and is planning 2 burgers for each of us. My notes from baking bread rolls in the past say that 3 oz is a good size for burger or hot dog buns, and 4 - 6 oz is "huge" - big enough for a sub. These puffed up so much that they may look smaller in diameter than they are. Perhaps I should have flattened them more during the final formation. We didn't have burgers last night, but plan to tonight, so I should be able to report back. Since I can see things I'll do differently next time - that are probably obvious to any competent bread baker - I'll keep the burger report in this topic. 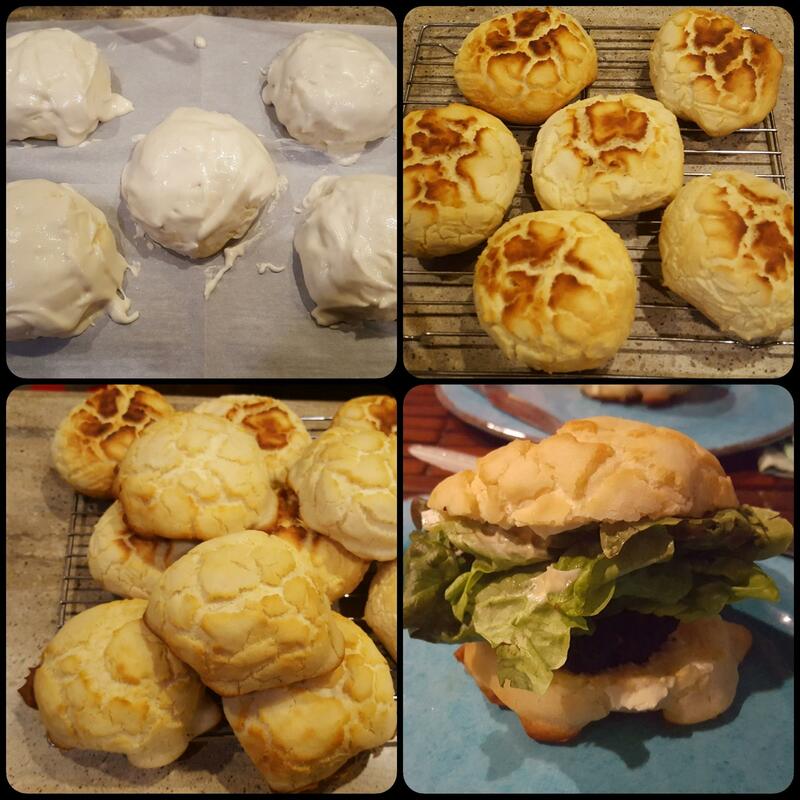 3 days after making those rolls, we finally used them for burgers. 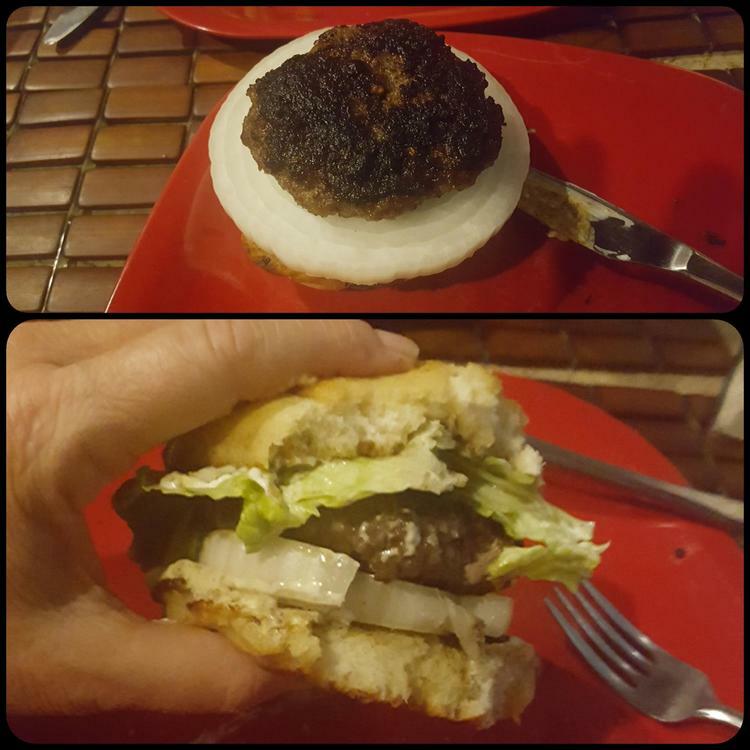 My darling thought the buns would be too small for the burgers. He forgot about patty shrinkage. Before we started cooking, the burger and the onion slice were the same diameter. By the time we ate, the burger and the bun were the same diameter, and there was a decided overhang of the onion slice. Make them flatter. These were so thick that they were almost unmanageable. Make them the day I intend to use them. Of course, I usually do that with good intent, then something gets in the way. The crunch layer wasn't as crunchy by the time we used them. It still had a nice texture and flavor, but it wasn't optimal. Make the main bread layer softer so that it can squish down. In the Bread topic, @Ann_T noted that she always does the stretch-and-fold method regardless of instructions. I think it would have helped make the bun a bit softer. I also think that the crunch layer would be compatible with other enriched bread recipes. Next time I try this, I'll use Peter Reinhart's recipe for soft dinner rolls from a Craftsy class I took a while ago. So...there's room for improvement, but the bread is worth pursuing. 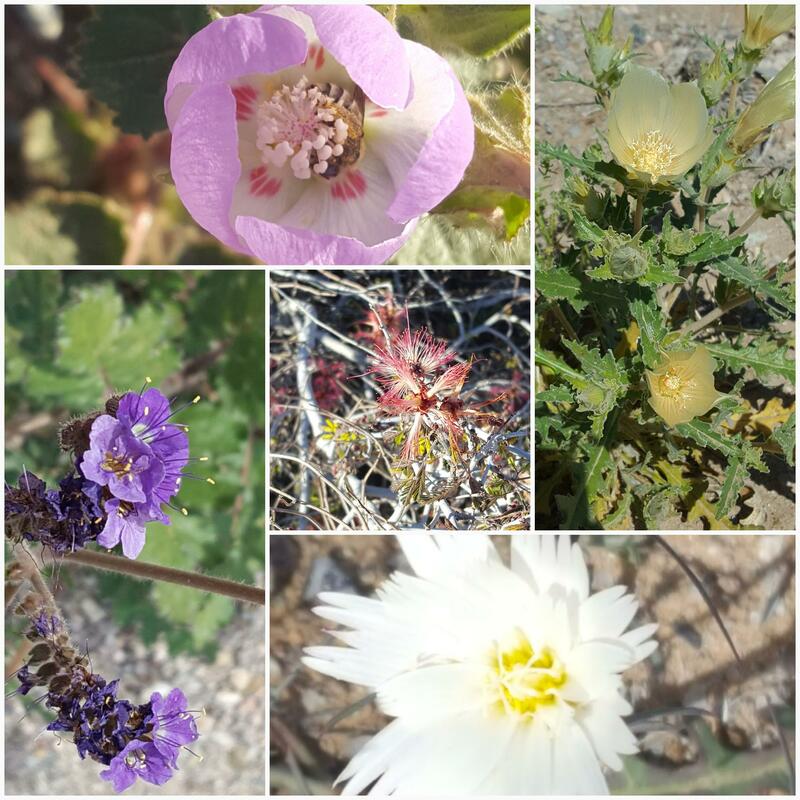 Death Valley is defined by the Panamint Range on the west and the Amargosa Range on the east. 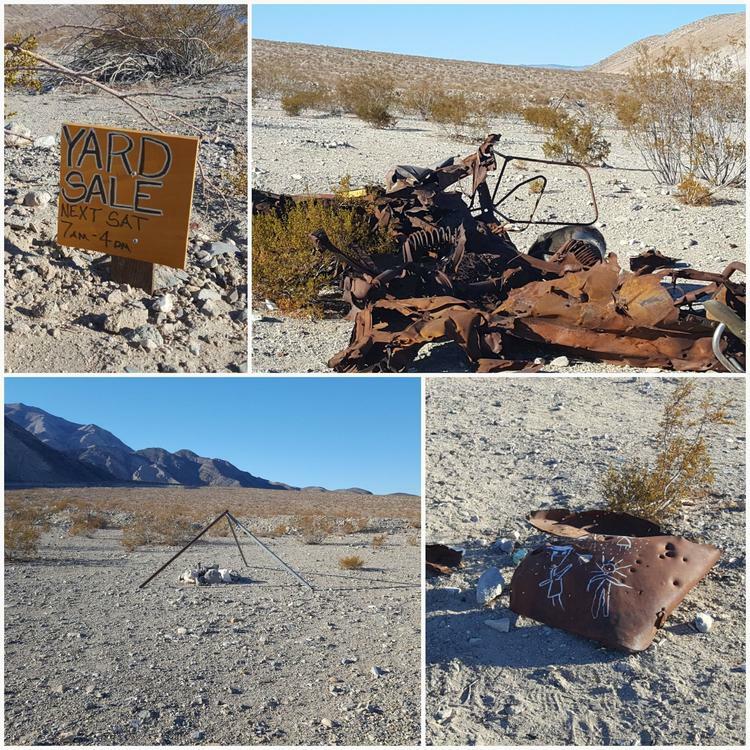 If you go directly over the Panamint Range, or (better still) use the paved road to drive over Towne Pass, you'll come to the Panamint Valley. It's a quiet place, almost entirely unoccupied because it's federal land. The northern and eastern edgesof the valley belong to the National Park System. Most of the rest is BLM (Bureau of Land Management) land. You can camp just about anywhere on the BLM land, as long as you stay within a certain distance of a road. We like the area for the open expanses, freedom to make noise without bothering neighbors, and the free air show: the China Lake firing range is due south, so we get a great view of the jets lining up for their practice runs, or practicing some of their aerial combat maneuvers. At the north end of the Panamint Valley is the Panamint Springs Resort. Although it's within the boundaries of Death Valley National Park, it is privately owned and operated. Some fuel and a few groceries can be purchased there, although we didn't need the groceries. 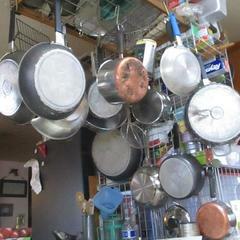 We had restocked (overstocked, in truth) the refrigerator and freezer before coming. We drove to the resort for beer one day, and for lunch another. 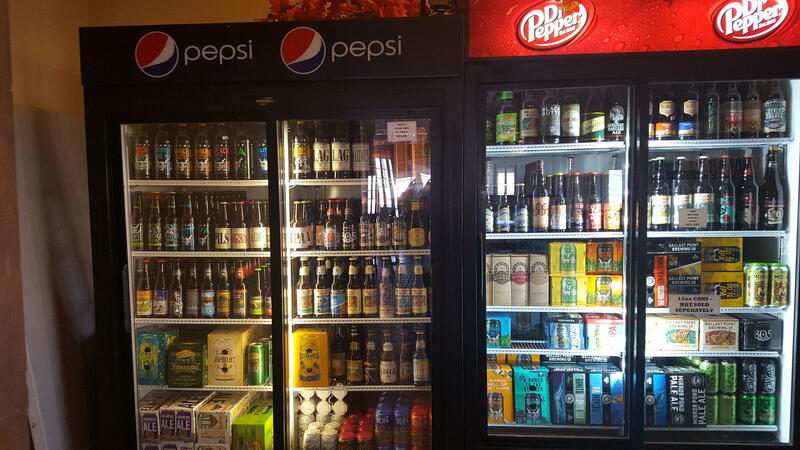 Their drink refrigerators are well stocked. Nothing's cheap - as with Death Valley, this place is remote and the prices reflect that - but they stock a lot of specialty brews from what passes for local microbreweries. The restaurant has a bar area as well as a separate dining room. You can eat or drink in either area. 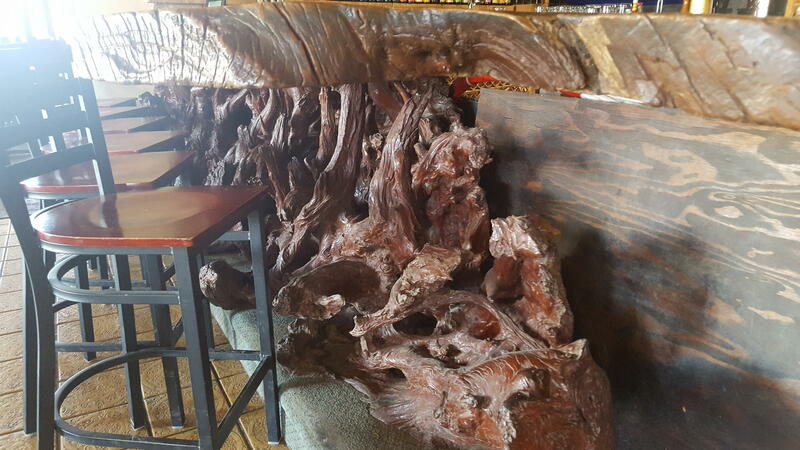 The bar counter is fascinating and deserves a closer look. 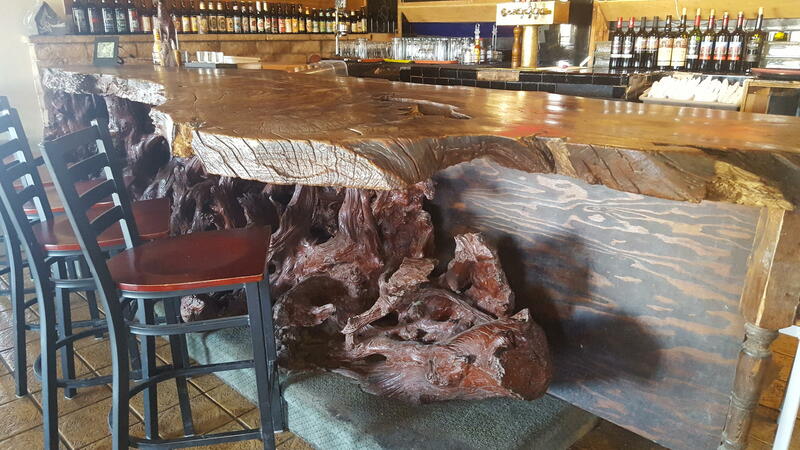 It's highly polished, heavily varnished, and made from a tree root system. It's old. It was rescued from a previous building and kept in place when this building was rebuilt after some calamity that neither of us remembers. A hole in the counter adds extra character, as well as a spill hazard for the unwary barkeep or customer. Here's a lower-view closeup of the root system. 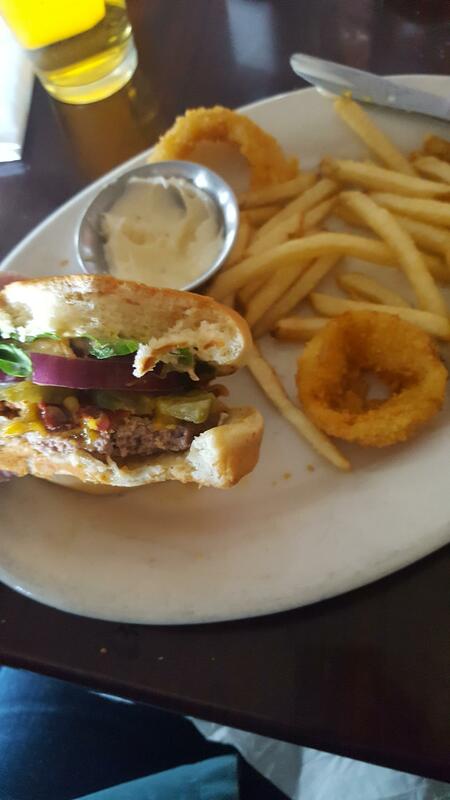 The menu isn't anything special, but they offered what we wanted: burgers, onions rings and fries. They were quite good. I don't remember what type of beer we had to go with them, but we enjoyed it all. We usually make dinner our main meal of the day, despite ideas that we might do better if dinner were light. That day, after such a heavy lunch, dinner was light. Cooking when we're on our own, after several weeks of visiting family and friends, can lead to a lot of experimentation and fun. 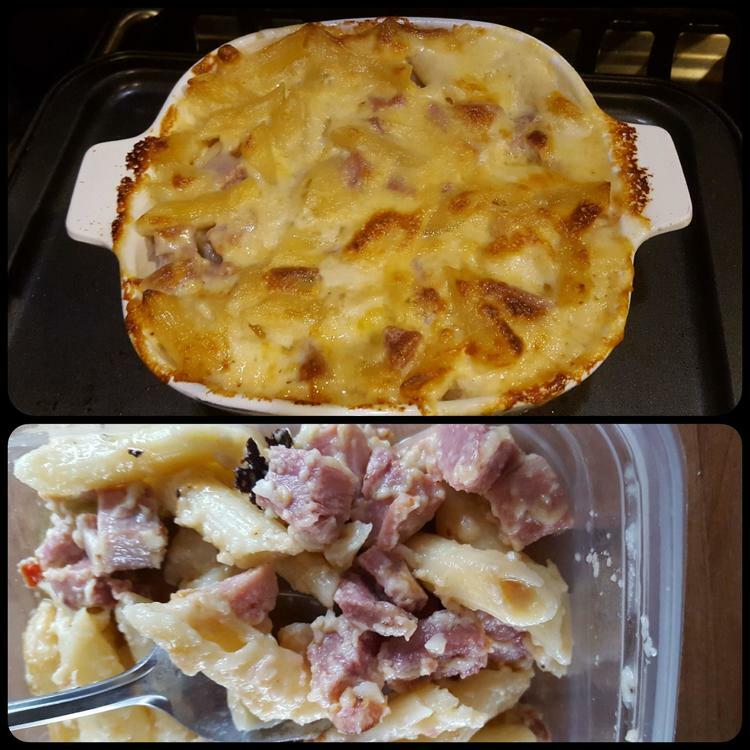 I finally got mac 'n' cheese 'n' ham right, using the remains of the ham I cooked us for New Year's. (I haven't shown you that ham yet. We're living backwards for now, like Merlin in The Once and Future King.) For once - and maybe for the future - I didn't overcook the pasta. The sauce was particularly rich, since I used the remains of heavy cream I'd purchased for a holiday baking product. I finally got around to trying Food 52's Spinach Madeline. Let me tell you, this is good stuff. 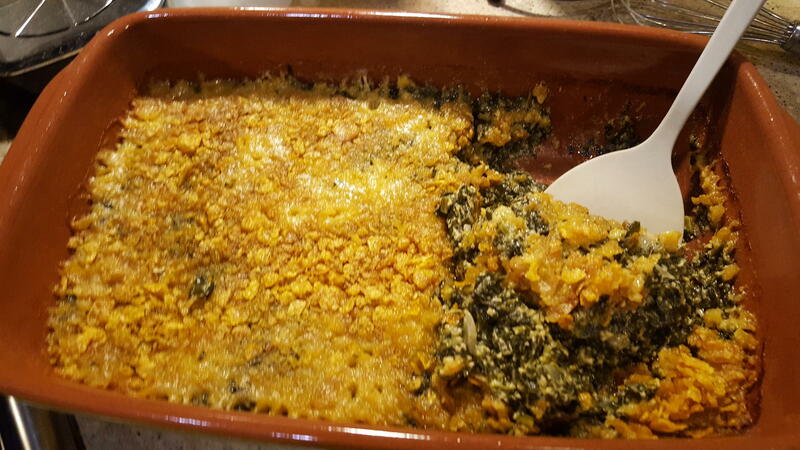 It was so good that even my darling, who normally does not like cooked spinach and is lukewarm even to raw spinach, liked this dish. He liked it so much that I was surprised. That in turn led to a surprising argument. Togetherness can do strange things. When we calmed down, we agreed that the recipe is a keeper. We still agree, having done it again since then. The final noteworthy cookery from that location doesn't, unfortunately, have a photo but it has a great quote. I had some assorted chiles and tomatillos that I'd purchased oh, sometime before the turn of the year in order to make a tomatillo salsa. I wanted to braise chunks of pork or chicken in it. That stuff had languished in the refrigerator as we went on our whirlwind of holiday socializing, and needs must that it be used. Some of it was already in rugged shape. I roasted, peeled and seeded the surviving poblano, jalapeno and fresno chiles, and chopped the roasted flesh finely. I roasted tomatillos and did the same thing. I added finely chopped scallions, then mixed the lot with chile vinegar, white balsamic vinegar, Mexican lime juice and salt until the flavor and consistency seemed about right. I was trying to duplicate a tomatillo salsa left over from a Schwan's frozen fish dinner that we had both liked back in the fall. I still have some of that salsa as a standard. My salsa was much too light on the tomatillos to come close to Schwan's, but it made a great braising liquid for those pork chunks. It all went over rice. It was very good. My darling's comment, heretofore unuttered: "You know, we could lose a lot of weight if you cooked food that doesn't taste so good." There's a historic echo there of an exchange that supposedly transpired between Careme and the Prince Regent of the UK, later King George IV. 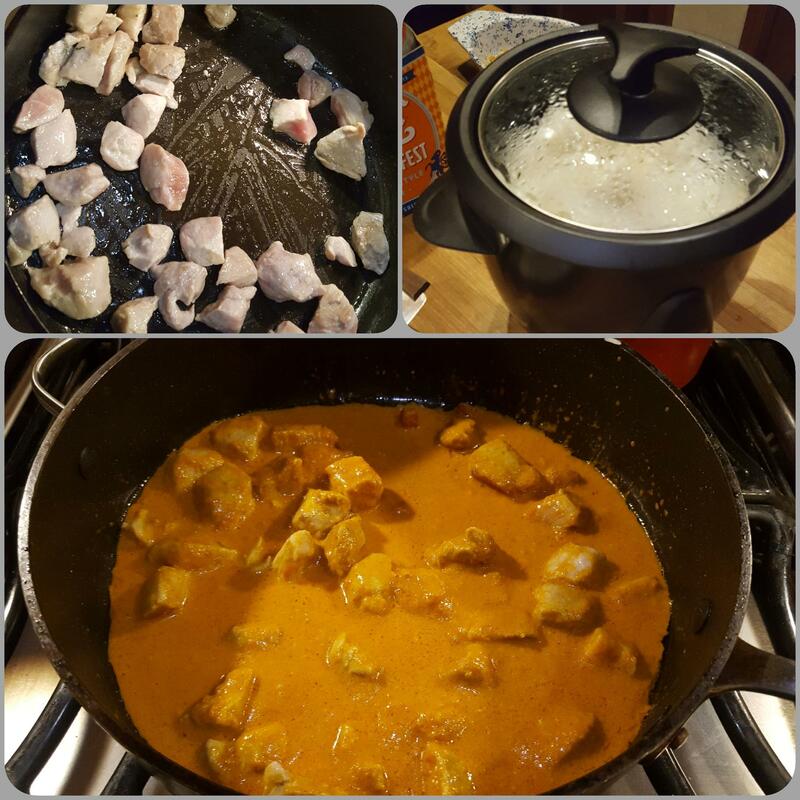 The future king told Careme something to the effect that "I'll get fat if you keep cooking like this." Careme, who already felt underappreciated in England, snapped that "stimulating your highness' appetite is my job, controlling it is yours." He left shortly thereafter. 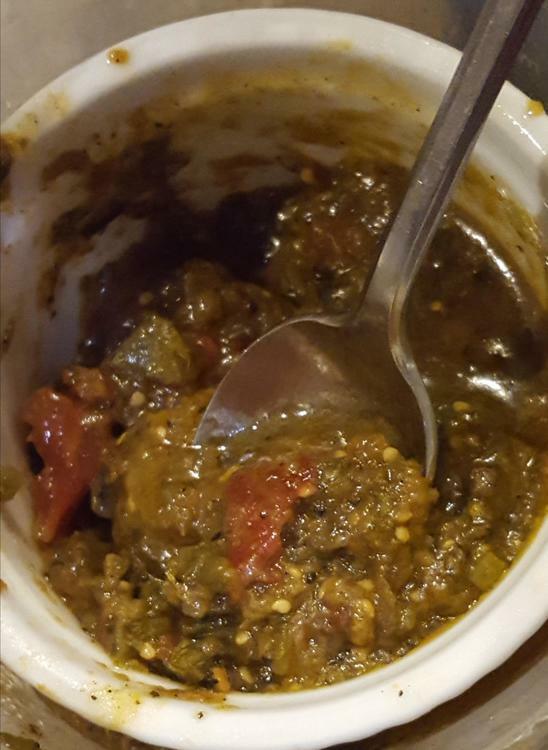 A carne asada salad last night gave me a chance to find and use the last of the aforementioned tomatillo-chile salsa. Two previous grocery stops offered irresistable opportunities at marinated beef, and I couldn't resist either time. 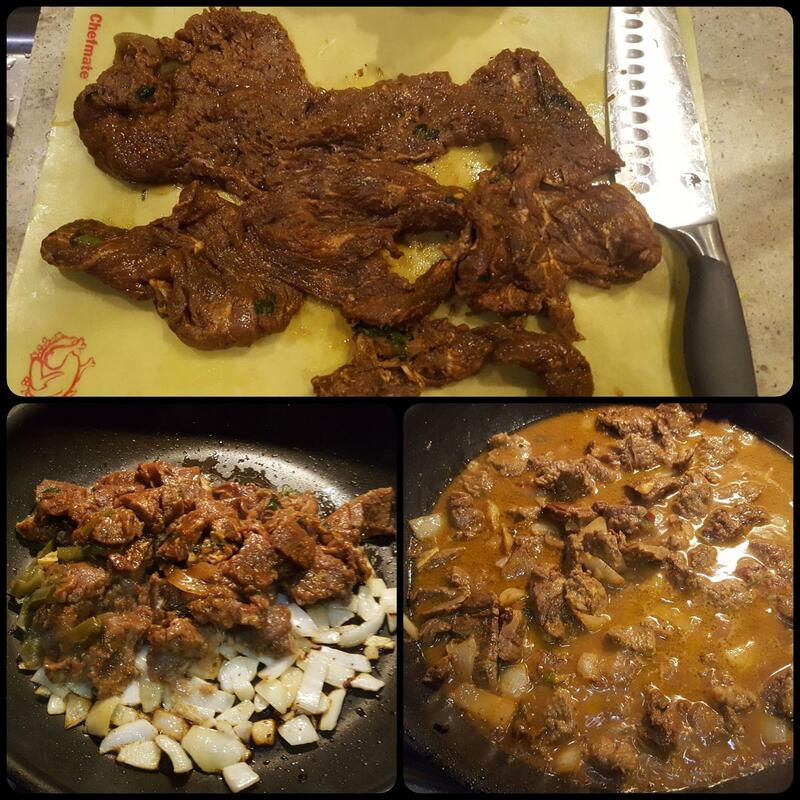 The first time I cooked some of it, we put it into tortillas along with the fixings. My darling thought that too much trouble. The next time, I put it into a salad. We both liked it that way, but that left us with tortillas still to be used. Last night, I wanted to finish the meat and get it out of the freezer. Here's the meat before chopping, starting to cook with onion, and finished to go over a salad. Yes, that's a lot of juice. I like wilted-lettuce and wilted-spinach salads, so I made sure to heat the marinade and cooking juice after the beef and onion were cooked, then augment them with citrus juice, a touch of oil and some red wine vinegar. 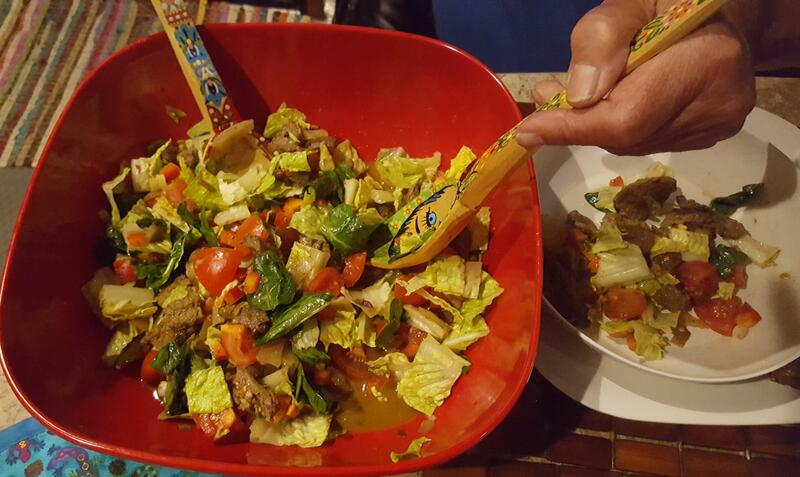 The whole shebang went over the salad and got a good mixing. We dug in. He ate his as he would any salad; I ate mine in tortillas, with sour cream and the tomatillo salsa. The photos of the stuffed tortilla were not pretty, and I didn't keep them. But I will show what the salsa looked like. It was just as good as I'd remembered. I hope I'll be able to replicate it. I wrote notes on it, but even with notes too many of my impromptu successes survive only in the Journal of Irreproducible Results. @Smithy Those beer coolers at Panamint Springs Resort have a lot of craft brewery beers, including a couple of my favorites. New Belgium Fat Tire, and my "house beer" Karl Strauss Red Trolley. I personally don't consider Laganitas a craft brewery any more, but it doesn't matter. They are hops crazy and I'm not much for pronounced, in your face hops. 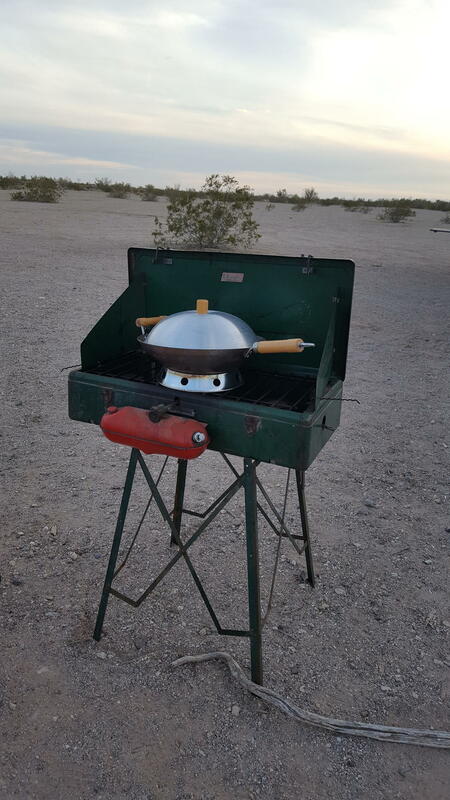 We've been set up for outdoor cooking, with little inclination to actually do it, since we landed in the desert. Oh, there have been a few campfires, with food cooked over them. However, it's been colder or windier than we would like. Compared to almost anywhere else in the country the "colder / windier" bit would be a laugh. We compare it to the comfort of cooking indoors, in the Princessmobile, where we can have a furnace running if need be. Earlier this week we decided it was time. I had some deep-frying to do, and the camp stove was the preferred source of heat. I went to fire it up...and discovered that it had quit working. I couldn't build pressure in the fuel container, because the pump didn't have a good seal. If anyone wants an explanation of how a Coleman camp stove (or lantern) pump works, feel free to ask. Suffice it to say that I know far more than I did, and we got it working without buying spare parts, but the outdoor cooking was put off for a few days. Today, we inaugurated the stove along with the wok I inherited from a dear friend last fall. Joan would have been proud. 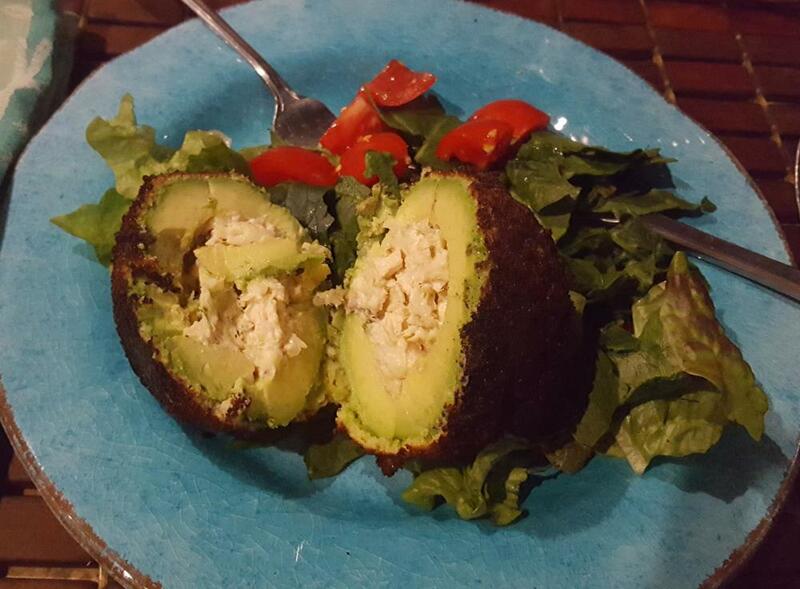 I wrote about the stuffed, deep-fried avocados in detail, in the eG Avocado Cook-off topic. I think it's worth doing again, with some possible revisions. My darling would always prefer something like the pork roast we've been feasting from for the past 2 weeks, with variations on what to do with the leftovers. But he's happy to see me having fun in the kitchen, and willing to put up with avocados for the cause. 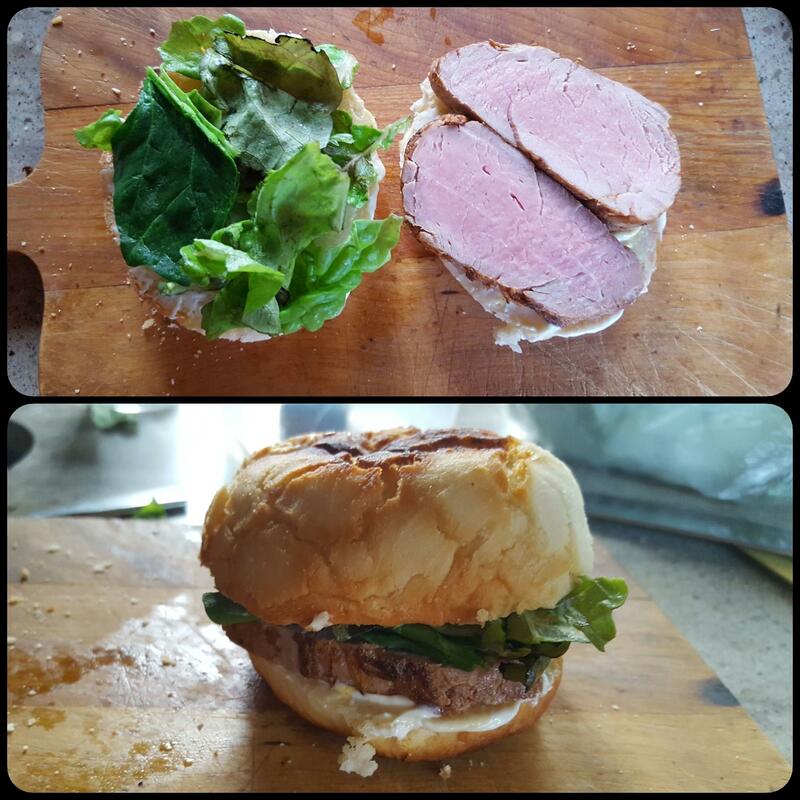 Today I took another crack at Dutch Crunch bread rolls. The last batch was an interesting proof-of-concept test, but I suspected that the interesting crunchy coating would work as well with a known good roll recipe. I used Peter Reinhart's recipe for soft dinner rolls, from his Craftsy class. I used the coating instructions from the recipe to which I linked earlier. This batch of rolls was better than the last. I still need to sort out or even out the oven gradient so I can brown the roll tops without burning their bottoms. That said, these were good. I'll say it again, especially to @Shelby: the coating is special, but the rest of the bread-baking is not. Use that coating on your favorite bread! I bet it will work! We had deep-fried burgers, made from a mix of ground beef and hot Italian sausage, tonight. It's lovely to be able to fry outside! @Smithy My DW and I bought a 3-burner Coleman stove at a yard sale 35+ years ago. The previous owner had ditched the white gas tank and purchased a propane gas feed tube/ control. I've had to replace it once. I love the convenience of propane. Also, I am loathe to store gasoline of any type. I've only owned electric lawn mowers for the same reason. One of the nice things about the propane converter is that you can use the disposable little cylinders or use a propane tank with a hose (my personal preference). I purchased some excellent avocadoes and roma tomatoes with the intention of making guacamole for a dinner party. The dinner party happened but the guacamole didn't, but nobody felt the lack. 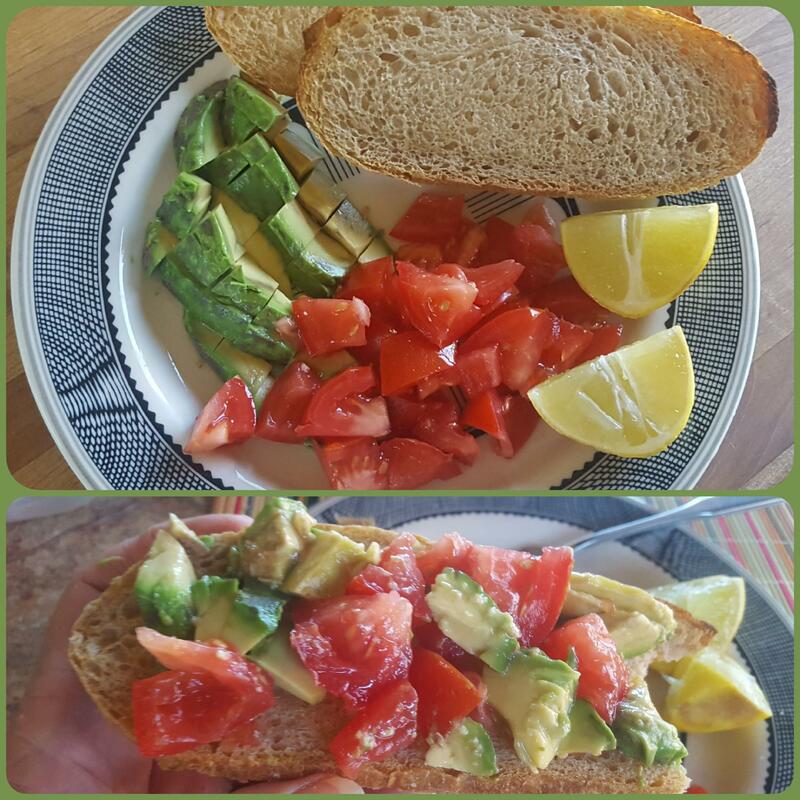 This morning, some of the tomatoes and avocados, with just a squeeze of Mexican lime, make a great breakfast on sourdough bread. This is the last of a loaf I made for the aforementioned dinner party. I'll tell more about that in another post. 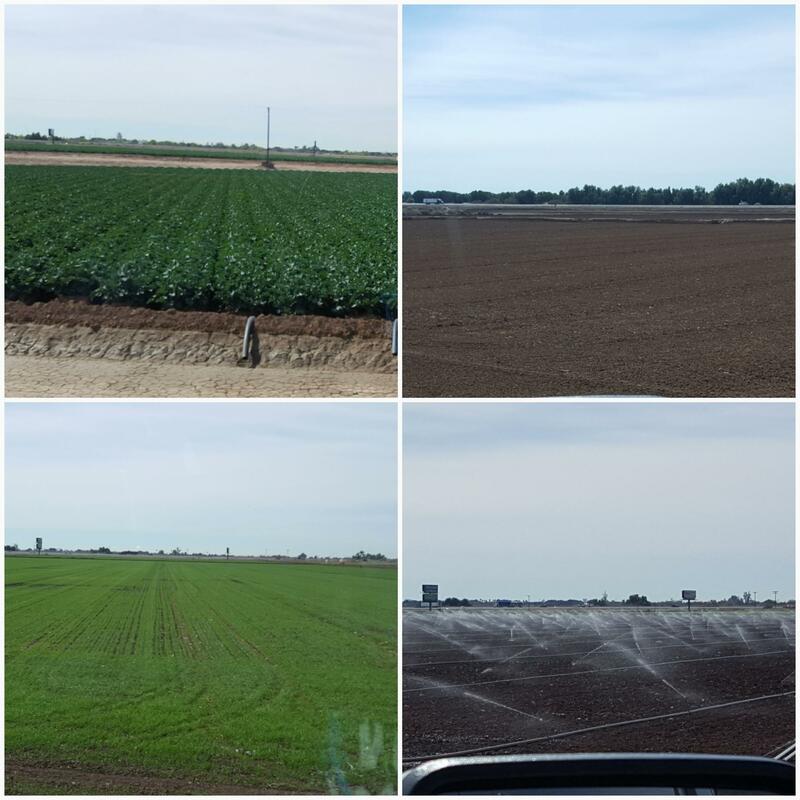 Someday, maybe, I'll take the trouble to find someone who can explain to me the exact sequence of planting and harvesting the row crops we see grown near Yuma in the winter. 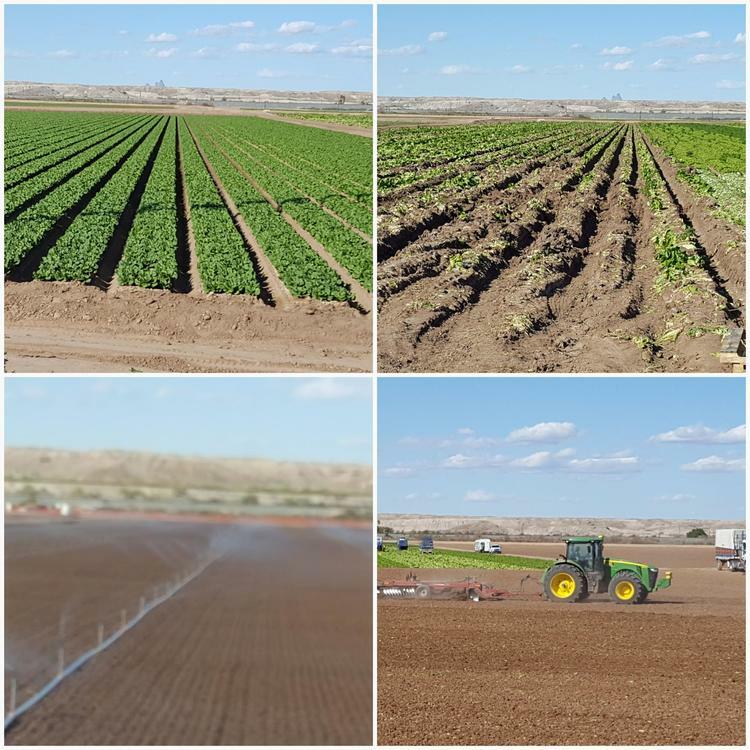 What we know from watching is that large fields of broccoli and cauliflower are planted, ripen fairly rapidly, and are harvested with the help of machinery and manual labor, seemingly in the space of a month. Within days after a field is harvested, the remaining greenery is disked under, sprinkler lines are laid, the field is watered, and then planting begins anew. One of many things I don't know is whether a new crop is sometimes planted - and if so, whether it's a crop rotation - or a field of grass always follows the crop. It may be that the grass is planted when the winter cultivation season is coming to an end. I also don't know why it would be grass, but it doesn't seem to be alfalfa, which would be a nitrogen-fixer. What I DO know is that I'm grateful for fresh winter produce, and we have been staying near one of the principal sources for the United States. These pictures (clockwise from the upper left) all took place within a week. 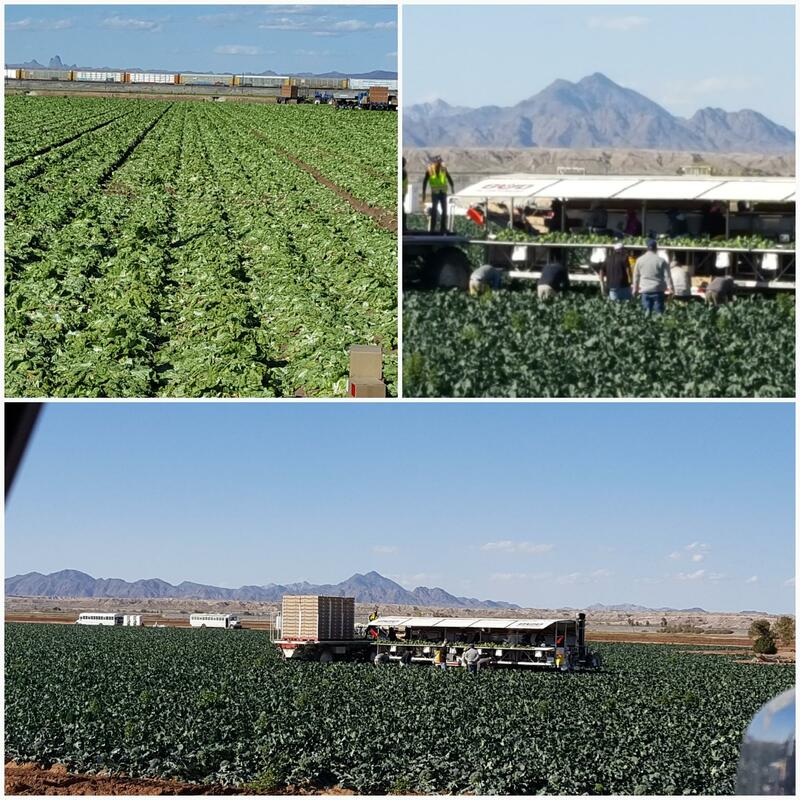 Here are some shots of the mobile equipment used for packing broccoli and cauliflower. It looks as though the same equipment and technique are used for both crops; only the packing boxes change. Spring was springing when we left. We left earlier than we have in past years in order to meet up with friends, but we weren't really ready to go. 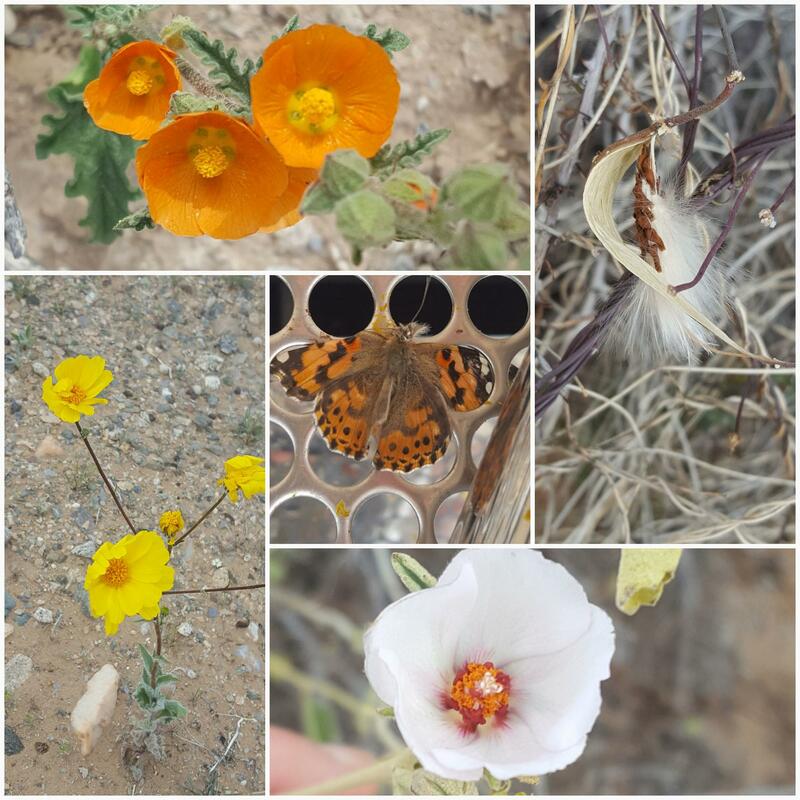 If there was a superbloom we weren't there to see it, but the flowers were good and the Painted Lady butterly migration was spectacular. Yes the cruciferous veggies have to be iced/quick cooled immediately so it is a rapid harvest process with an intense storage/delivery distribution mechanism. I imagine that with such growing crops the soil needs to be "re-energized" before another round of anything unless "over fertilizing" is on deck. Interesting about the quick cooling. 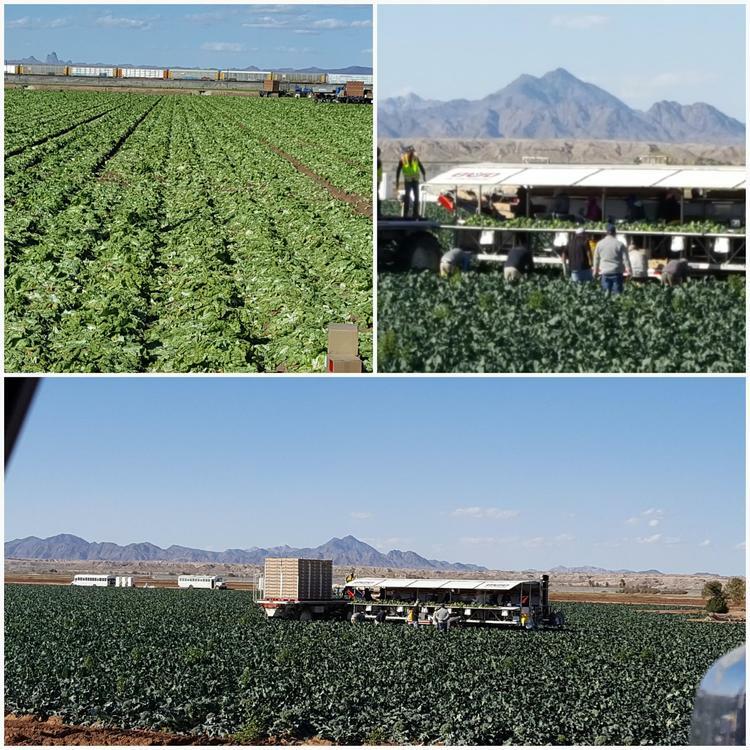 We weren't close enough to the operation to be sure, but it looked as though these vegetables were going straight from the field to a conveyor belt and into cartons. Maybe the cartons are hustled to refrigeration units; there are certainly buildings big enough for that operation in Yuma. I too would imagine that the soil needs replenishing. That's why I'm surprised that they don't seem to be planting alfalfa or another legume. They may use tons of fertilizer in a sequence that we've never observed. I can feel isolated and inconvenienced with boondocking, but the wide-open space and quiet settle into me anyway. Then it's an adjustment to return to closer quarters and more rules. 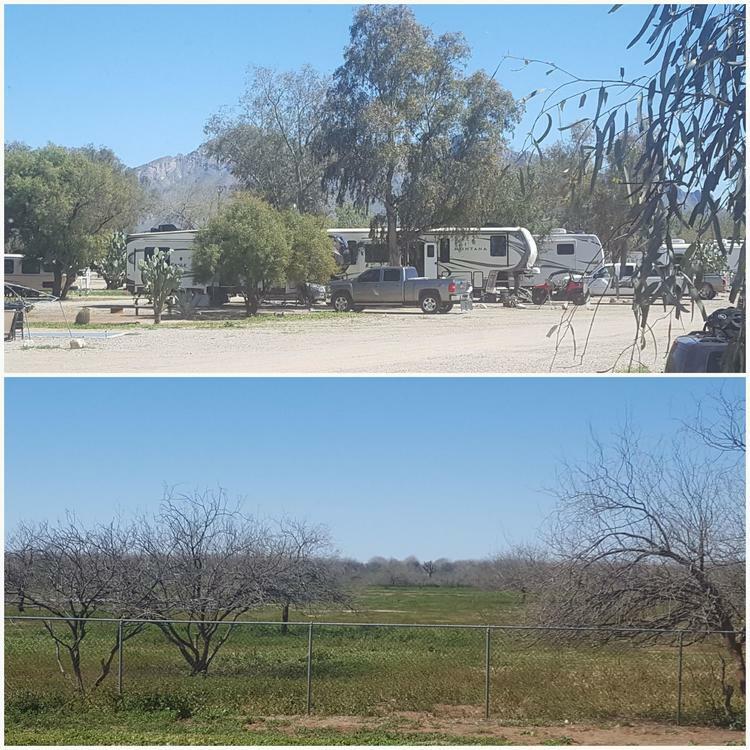 There are worse places to be for that re-entry than the Picacho / Tucson NW KOA campground. The view is pretty good, especially if you're lucky (as we were) to get a spot at the western end of the trailer line. There's shore power again! We have electricity without relying on our batteries or generator. I've made great use of that with the Joule circulator and the Instant Pot. I'll show some of the IP work later, but here are some slices from a sous vide pork tenderloin. There is also a hungous pair of chicken breasts, sous-vided and chilled and ready to slice into sandwich slices or chop up for chicken salad. I haven't taken a picture of that yet. I used 150F for a couple of hours instead of my usual 160F for one hour, which seems to dry it out. I'll be interested to see how the texture is different. A change closer to home, so to speak, is this campground's ownership. 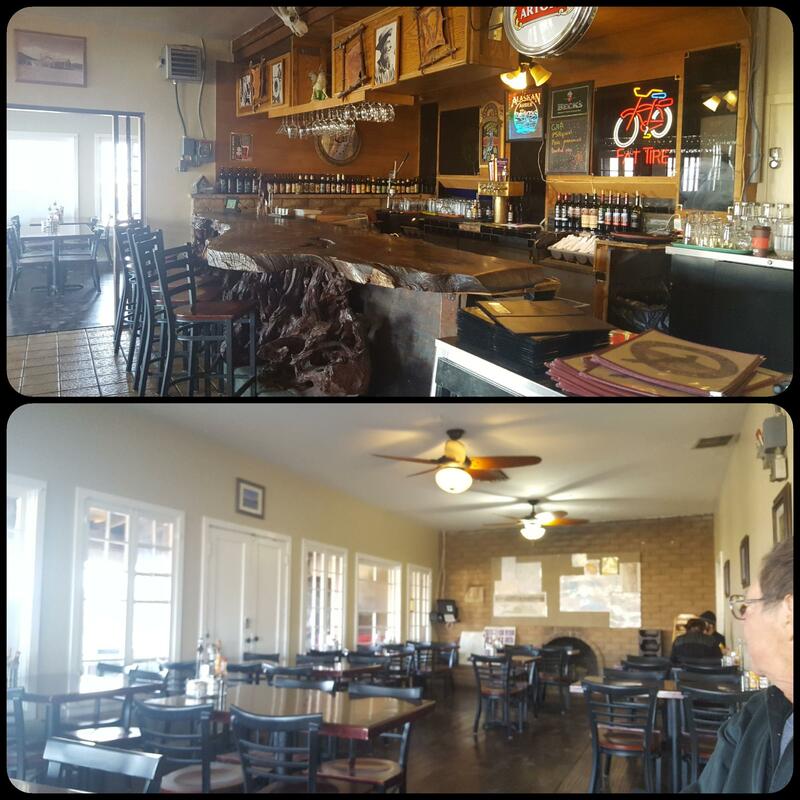 The atmosphere is still relaxed, and the new owners are lovely and energetic people. They're making the brave decision (probably a necessary financial decision) to stay open year-round, whereas the previous owners closed the campground during the hottest months. I wish them well. This is drastic, and very disappointing. 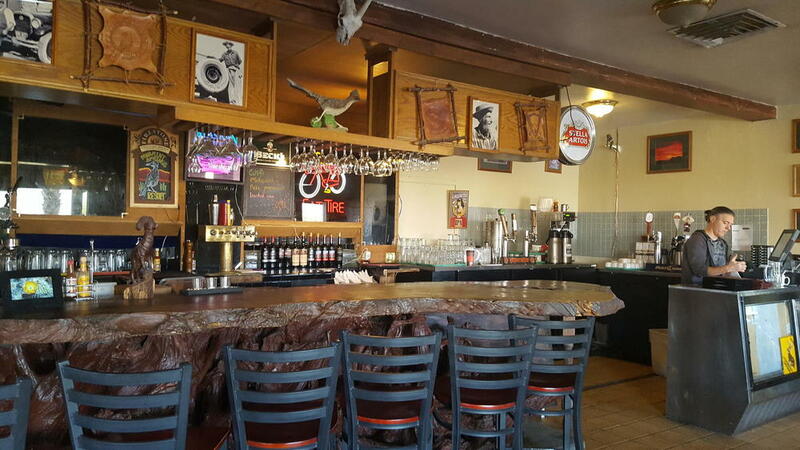 I've written before, probably several years running, about Frankie's Chuckwagon Steakhouse. Here is a 2017 entry, with pictures, so you can see what they did. The food was excellent, and while it wasn't exactly inexpensive it was one of our favorite types of place: easy to get to, generous portions, excellent food and service, relaxed atmosphere. Once we stumbled over this place, Frankie's was a major reason for our return to this campground. At least once each trip, we'd blow the budget (and diet) on dinner there. The restaurant is temporarily closed for renovations, and they hope to have it open sometime this spring. 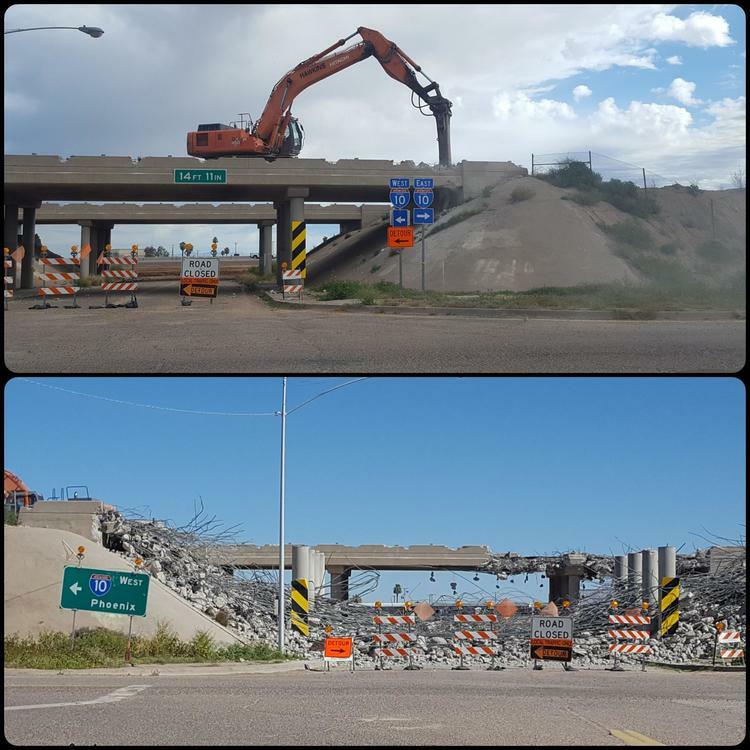 When it reopens, it will be considerably scaled down. The new owners don't know yet quite what they'll do, but they are so overwhelmed with running this new (to them) campground and hitting their stride that they don't want anything as elaborate as a steakhouse. It takes too much expertise to run the Santa Maria grill, and they haven't been able to recruit the sort of staff they'd need. The new place will be something like burgers and fries, or pizza. Maybe there will be a pool table (I don't know where they'd put it) and a TV screen or two. 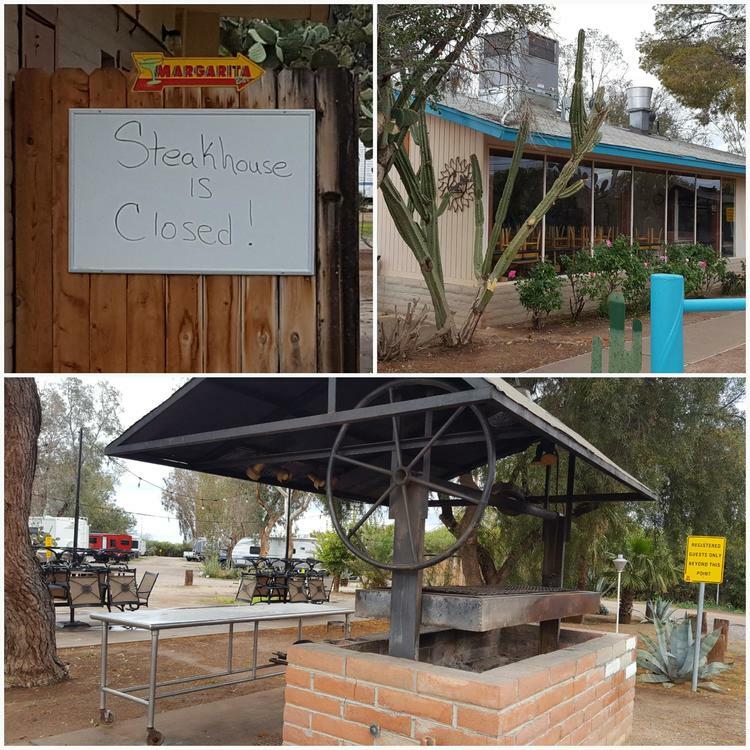 It will be, we're told, more in keeping with restaurants found at other KOA campgrounds. Oh, dear. Maybe I shouldn't jump to conclusions, but I rather doubt the new incarnation will be the regional draw that the original was. I know the previous owners ran themselves ragged trying to run both the campground and the steakhouse, and relied heavily on camp volunteers. I also know they had been trying to sell out for 2 or 3 years, and they must be relieved to be free of the enterprise at last. Still, I'm disappointed. I could taste the steaks from 100 miles away, and the joy of another visit had helped compensate for moving back into more crowded conditions. @Smithy That tenderloin looks good how long did you end up cooking it for and at what temp? Too bad about the steakhouse. It's always disappointing when you look forward to something and it is no longer available. Given the mixed bag of advice I got in the What Are You Cooking Sous Vide Today? topic (including yours and @rotuts', thank you!) I decided to take the middle road and follow @Shelby's advice: 135F for a little over 2 hours, then a quick sear. I rubbed it ahead of time with smoked paprika and a grilling rub. I liked the texture and doneness of it, but honestly, I think it would benefit from a marinade ahead of time because it's such a lean cut. I've been happily putting it on sandwiches with lots of mayonnaise, mustard and other condiments to make up for the lack of flavor and fat.